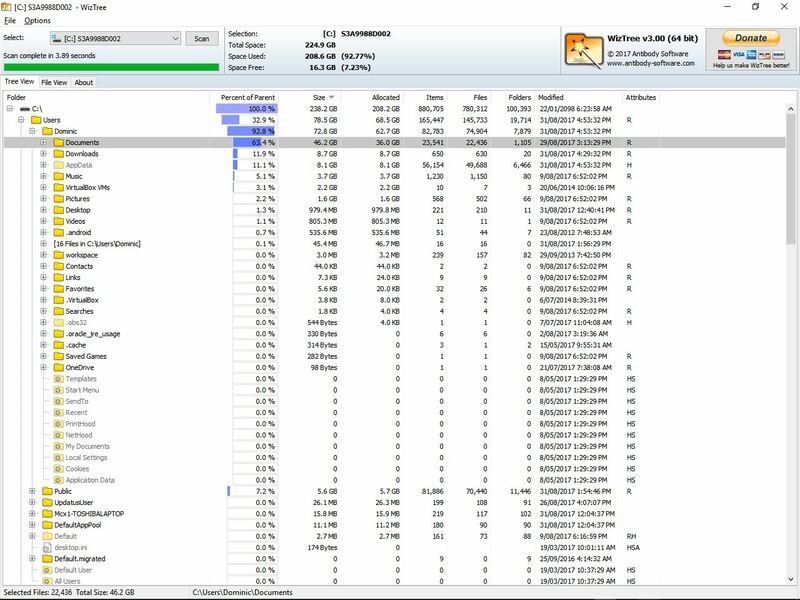 WizTree is a hard drive disk space analyser similar to WinDirStat but is MUCH faster. WizTree is FREE! However, if you find WizTree useful and would like to help to support further development, you can make a donation. If you're using WizTree in your business please help us out - we're a business too! After you make the payment we'll email you a unique "Supporter Code" along with instructions on how to use it to remove the "Donate" button from WizTree. This will be sent to your PayPal email address and the "Alternate Email" address if you entered one. Thank you! If you've already made a WizTree payment and can't find your "supporter code" please click on the "Lost Registration Codes" link on the left to have it emailed to you. Find files on your hard drive almost instantly with WizFile. If you like WizTree we're sure you'll like WizFile too! Installed and portable versions available. Finds the largest files on your hard drive. Every single file on your hard drive can be sorted in order of size. 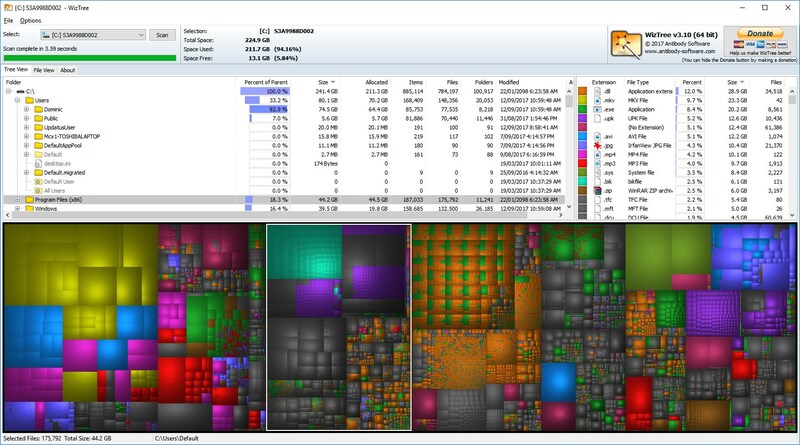 WizTree is the world's fastest disk space analyzer. It scans your hard drive and shows you which files and folders are using the most disk space. It does this in the FASTEST way possible - you simply won't find any other application of this type that's quicker! Use the information WizTree provides to quickly locate and remove "space hogs" from your hard drive. WARNING: Take care not to remove any files that are required for the correct operation of your PC! What makes WizTree so fast? When scanning NTFS formatted hard drives (most modern hard drives use this format), WizTree reads the hard drive's Master File Table (MFT) directly from the disk. The MFT is a special hidden file used by the NTFS file system to keep track of all files and folders on a hard drive. Scanning for files this way completely bypasses the operating system (Windows) and provides a huge performance boost. Press Ctrl+Alt+E or right click on a file/folder and select "Export to CSV file...". The selected files and/or folders will be exported to a comma separated value file (.CSV format). The information exported will depend on which view is currently active (Tree View or File View). If no files or folders are selected then ALL files and folders will be exported. For folders, the file name will always end with a "\", e.g. "C:\Windows\"
For folders, the Size and Allocated fields will be the total size of all files and folders contained within that folder. For files, the Size and Allocated fields will be for that individual file only. The "Allocated" value will be prefixed by a leading 0 if the file is a "hard link", indicating that it does not take up any additional space on the hard drive and should not be counted as part of the total space used. Modified date is in format "yyyy/mm/dd HH:mm:ss"
The Files and Folders values only apply to folders and show the total number of files and folders within that folder. Press Ctrl+Alt+C or right click on a file/folder and select "Copy file and size info to clipboard". File size and name information will be copied to the clipboard in a human friendly format, suitable for pasting into emails, support forum posts, or text documents. The files will be indented to match the current tree structure, and only currently visible files within the selection will be included. As of WizTree 3.18 it's now possible to automatically export file data to CSV file via the command line. "Drive/folder" can be a drive letter like "C:" or a folder name like "C:\Windows"
Filter option can be used to export only files matching the file specification, e.g. "*.mp3". The entire path and file name is used when matching. Use the /admin flag to set desired admin mode (fast MFT file scanning is only available when running as administrator - use the /admin=1 parameter). To set WizTree up to run with Administrator rights via Windows Scheduler you will have to configure it to "run with highest privileges" and select an administrator user account to run it. Running it this way will prevent the Windows UAC popup from appearing. By default both files and folders will be exported. Use the exportfolders / exportfiles parameters to disable file and/or folders from export. The MFT record number can be included in the export data file by using the exportmftrecno parameter. This record number can be used as a unique file ID number. Note that the MFT record number is only valid when exporting an entire NTFS formatted drive and when WizTree is launched with administrator rights. To call wiztree.exe from a batch file script, use start /wait wiztree.exe to wait for the export to complete before moving on to the next line. If you're using 64 bit Windows then use start /wait wiztree64.exe as wiztree.exe will launch wiztree64.exe automatically and return immediately. start /wait wiztree.exe "D:" /export="f:\export\testfiles.csv" /filter="test"
start /wait wiztree64.exe "D:" /export="f:\export\testfiles.csv" /filter="test"
As of WizTree version 3.22 it's possible to dump the MFT file via command line. Use %d and %t in filename to have them replaced by the current system date and time (YYYYMMDD and HHMMSS format). Installer and portable versions updated with updated Russian, German and Slovak languages. No changes to application executables. WizTree CSV files exported via the "export to CSV" option may now be imported and viewed. Select "<CSV File>" in the selection combo box (or press Shift+F3) to select a CSV file to import. MFT files now also store the drive letter of the original dumped drive so correct drive letter will be used when loading a previously saved MFT file (instead of 'C'). Must use version 3.22 or newer for this to work. Treemap colors can now be configured (Options->Colors...). Default and Color Blind color presets are available. Fixed bug introduced in 3.20 that could cause certain files to appear in the incorrect position in the tree view. Command line export now allows for MFT record number to be included in the export data file. This can be used as a unique file ID number. Note that the MFT record number is only valid when exporting an NTFS formatted drive and when WizTree is launched with administrator rights. It's now possible to select all files with a particular extension by right clicking on the extension in the "File Types" view and clicking "Select". Note that this may take some time if there are many thousands of files. Copy file and size info feature added. File export feature added. See documentation above. Portable version no longer enables "Windows Explorer context menu" by default. If you enable this option when using WizTree portable then please remember to disable it when you're done with the PC otherwise the WizTree context menu items will remain on the PC even if WizTree portable is no longer accessible. The donate button can now be hidden by making a donation (Pay what you want). You will be emailed a unique "supporter code" after you complete the payment. Click on "File->Enter Supporter Code" or press F12 to enter it and remove the donate button. Your support is appreciated! 64 bit version now available. The 64 bit version can work with extremely large MFT files. "Allocated Size" now displayed for each file/directory. This is the amount of actual disk space used by the file including any additional named data streams attached to the file. MFT dump now appends volume information (bytes per cluster, sector, MFT record etc) to the end of the MFT file data. WizTree now reads this information from the MFT file if it's available instead of making any assumptions which if wrong would lead to incorrect MFT parsing. 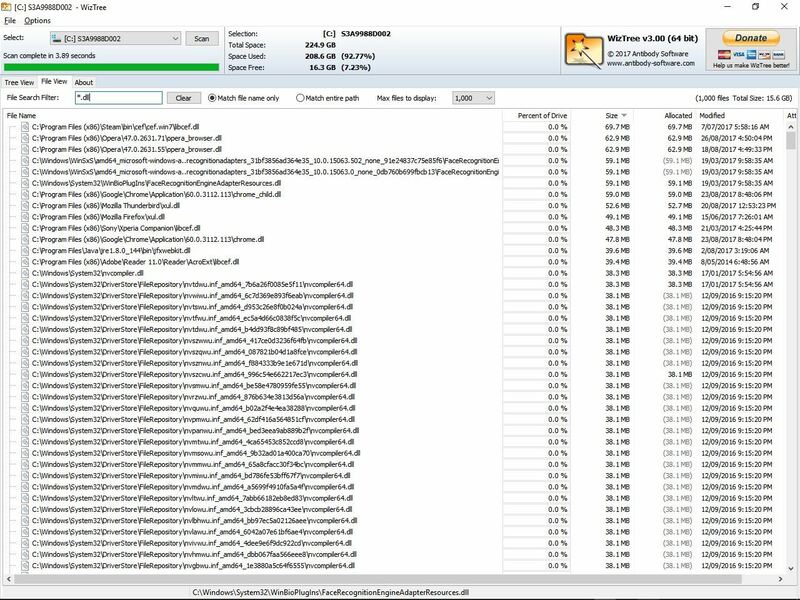 Background file monitoring for deleted files now uses a different more robust method. If WizTree detects that a file or directory has been deleted it will put a red line through it and remove it from the totals. MFT processing has been optimised so WizTree is even faster than it was before! Full translation support added. Click here to find out how to add a translation. Fixed bug that could cause incorrect file sizes to be extracted from the MFT on some PCs.